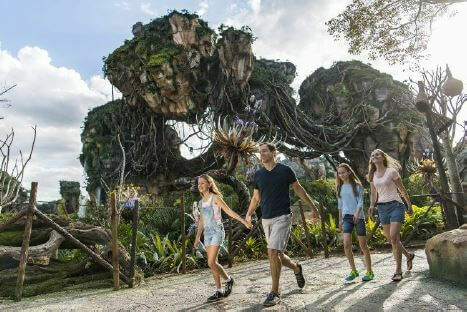 Get ready to go out of this world when you visit Pandora – World of Avatar at Disney’s Animal Kingdom. As a Disney Vacation Rental Home Connection member, VillaDirect got to visit early and take a look around. Here’s 5 tips we learned during our visit that we thought would be helpful to pass along to our guests and friends coming to Animal Kingdom. First of all, think like an explorer. You’re over 4 light years away from Earth when you visit this corner of the universe. Everyone in the park is going to call you a “Traveller“. If you really want to impress them, say “Cal-tee” which means hello in the Pandoran native language. Immerse yourself in this alternative world full of strange sights and sounds. Second, it’s hot here in Florida – and also on Pandora. If you and your family want to escape the heat and humidity like we did – just head to the rides in Pandora. Both of the feature rides are indoors, shaded and air conditioned. The “Na’vi River Journey” is a gentle family ride that everyone will enjoy. Climb aboard a reed boat for an adventure down a gentle, mysterious river hidden within the sacred bio-luminescent rain forest in search of the Na’vi Shaman of Songs. Or take a trip to the “Avatar Flight of Passage” which is also indoors – although it doesn’t feel like it! 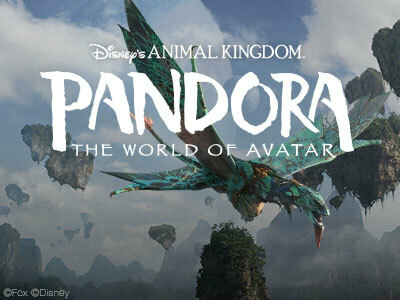 This 3-D expedition transports you on a sweeping, simulated flight over Pandora’s colorful landscape. First, bond with a mountain banshee—an important rite of passage for the Na’vi. Then, soar around floating mountains, plunge through ancient caverns and across roaring oceans in a thrilling aerial adventure. Third, if you get hungry after your interstellar trip to Pandora and want to eat while you’re here, you’ll be eating healthy foods. Head over to Satu’li Canteen. In Pandora, all the natives value healthy food options, so they offer meals including healthy proteins, grains, fruits and veggies to enjoy. We tried some, and it tastes a lot like really good food from Earth! Number 4, if you’re a grown up earthling, then you might want an adult drink when you visit Pandora. Head to Pongu-Pongu, which means Party-Party in Pandoran. It’s the place for adults to get a “local” Pandoran (adult) beverage. These include cocktails that glow and have flashing lights. Drink up – it’s party time! And last, the most important thing to know about Pandora is to come back and visit the “planet” AT NIGHT! All the plants and floating mountains are a wonderful sight during the day, but at night, exotic Pandora really comes to life! With glowing sidewalks and pathways through bio-luminescent plants and scenery. We hope that you come and see Pandora real soon and we’d love for you to stay in one of our fabulous VillaDirect Vacation Homes as the place to stay when you’re exploring Pandora. Come and experience the family fun offered this summer at the parks of Orlando! For information on tickets or event times, contact a VillaDirect Guest Service associate at 866-934-9177 or email guest@villadirect.com.